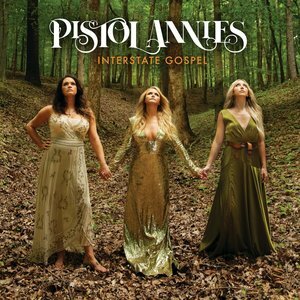 Pistol Annies offer hope through their heartbrokenness and comfort through community on their third album, Interstate Gospel. Drive down any country road in the South, and you'll inevitably pass a quaint, old church building accompanied by a sign which reads something like this: "Life without Jesus is like a broken pencil; it has no point." These pun-laced proverbs are always good for a chuckle and an eye-roll. They're strangely comforting, though not in any way profound, and mostly serve to lighten the mood of drivers passing by. One such driver is Pistol Annies member Angaleena Presley, who presented to her bandmates the idea of writing a song about the Southern staples. From there, the Interstate Gospel became the guiding force of the Annies' third album, but not because the album's full of eye-rolls and cheap punchlines (though those cheekily appear on the title track). Instead, Presley, Miranda Lambert, and Ashley Monroe seek to spread the truth of their own lives and the lives of those around them, and just like those church signs, offer a place of comfort in the midst of brokenness. The Gospel of Pistol Annies is not one filled with saccharine self-help soundbites. They've heard too many of those, as Presley sings, "The radio's on / The sweetest of songs / But I know they're lying." Instead it's a sermon fueled by heartbreak and regret, like when a parent tells you, "Do as I say, not as I've done." "The Best Years of My Life" finds Lambert settling down in a "ten-cent town" because she "didn't think that [she] could do better". So instead of reaching for something greater, the trio takes turns describing what the "prime" of their lives look like: "I picked a good day for a recreational Percocet / I've got the hankering for intellectual emptiness / I'm gonna mix a drink and try to drown this worthlessness." Although the Pistol Annies may be portraying relatable characters in a poor, rural town, it's not difficult to imagine the constant fight they experience, a fight against giving up and settling for less in a male-dominated country music landscape. It's disheartening that though the trio have had success in their solo efforts (especially Lambert), their highest charting song as a group on the country charts peaked at 41. Meanwhile, the Blake Shelton single "Boys 'Round Here" which features the Pistol Annies peaked at number two. It's even more disheartening to look at the Billboard Hot Country chart and see a mere four songs in the top 50 performed by female artists. One of those is a collaboration between male/female duo Sugarland and Taylor Swift. Another is a pop song by Florida Georgia Line and Bebe Rexha. It's near impossible to have a hit as a woman in Nashville. But the Pistol Annies keep at it for the sake of truth, for the sake of expressing their voices and hoping they land on the ears of a kindred spirit. They may have grown completely cynical about the world, as can be heard on the "been there, done that" track "When I Was His Wife". But Lambert, Monroe, and Presley offer hope through their heartbrokenness and comfort through community. On album closer "This Too Shall Pass", the three friends sing in harmony, "We get each other high / We make each other try / We make each other want to cry / We make each other laugh / We set each other free / Honey, can't you see this too shall pass." Just knowing that someone else is carrying burdens along with us gives us the strength to press on. That's the honest, road-worn gospel the Pistol Annies offer here. It may not be as silly and smile-inducing as those church signs on the side of the road, but it sure is satisfying.